where you’ll find sweet treats with a sprinkling of baking science. With almost 1,000 posts, recipes, tutorials, and more, there’s SO much to be discovered here. Let me help you navigate it all. We do a baking challenge every month and one randomly drawn winner gets a PRIZE! It’s super fun and inspiring. To participate, be sure to join my email list so you know when every challenge is. You’ll get a special gift for subscribing: my baking secrets guide! Cookies are what I’m known best for. 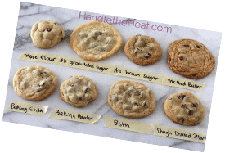 You may have seen my Ultimate Guide to Chocolate Chip Cookies comparison photo floating around the Internet. If you want to watch me demonstrate how to make great chocolate chip cookies LIVE, with all of my scientific explanations, tips, and tricks, check out the Facebook LIVE video I did a while back! comparison photo floating around the Internet. Click Here to see more videos! We have a thriving private community on Facebook where you can befriend other baking enthusiasts and get tips and inspiration. Request to join (you must answer the questions to be added). 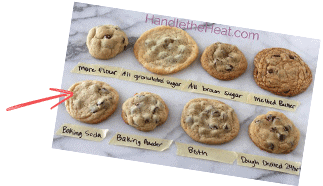 Learn how to create your OWN cookie recipe that everyone will beg you to share!